Torture is one of the dictators’ instruments. The dictators are still in power despite the fact that the citizens don't have any interest on them. The dictators have no other alternative to stay on power unless, they terrorize, torture and kill any one they might suspect. Not only torture, the law they apply on the people is more than the physical torture. Ethiopia is one of the examples that the people are unable to make a single voice and they remain voiceless casting from the 2005 presidential election which was turned an excessive military use of torture, imprisonment and mass killing. Since 2005, the Ethiopian government continues mistreating, killing, torturing and intimidating as a part of unwritten permanent law the officials apply it frequently. The international communities yet not expose the brutality in Ethiopia. The citizens are considered the reasons, as "the regime is licensed to kill its own people". The number of the victims not clearly registered because it was out of management and no group were able to do this. Since the government politics is ethnic federalism, the torture was based as ethnic torture. Today, 75% of Ethiopian are the victims of 2005 mass repression in Ethiopia and lack of support from international community. They remain voiceless and unable to stand for democratic revolution. Generally, the nations in the Horn of Africa are the victims of torture since the dictatorial regimes continue on power. Yes, torture is an illegal & serious crime. International law must consider it as international crime. Therefore, the criminals must be brought to justice. * You are at Bring them to Justice. * Read about beautiful places in the Horn of Africa, such as Gondar and Kordofan. at the 100 beautiful sites linked above. * Watch movies shot in the Horn of Africa at TV Cinema App. * Use the comment link below to comment and share the page. Join in and write your own page! It's easy to do. How? Simply click here to return to Are You Intellectual?. I promise to use it only to send you HOA Political Scene. The Sudanese Regional Policy is Planned to Rule the HOA! hoa-politicalscene.com/horn-africas-political-tragedy.html - Horn Africas Political Tragedy by journalist & poet Khalid Mohammed Osman on iTunes. hoa-politicalscene.com - Love in the Internet Time by Sudanese journalist, poet and writer Khalid Mohammed Osman on iTunes. hoa-politicalscene.com - Rising of the Phoenix by Sudanese journalist, poet and writer Khalid Mohammed Osman on iTunes. You can work the French versions and the Spanish versions of the two books above with me on, one on one bases. Contact Us. Up, you can like, pin, share and enjoy Arabic poetry on beautiful images. Down, you can get the books and enjoy reading poetry, politics and stories. 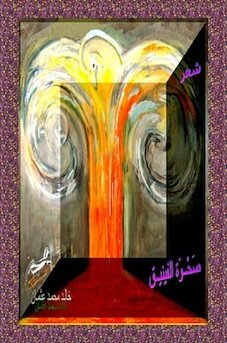 hoa-politicalscene.com - Poet Khalid Mohammed Osman's poetry book, Rising of the Phoenix. 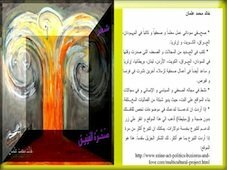 hoa-politicalscene.com - The second addition of Poet Khalid Mohammed Osman's poetry book, Rising of the Phoenix. 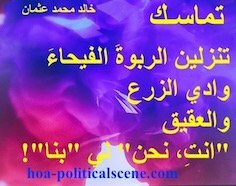 HOA Political Scene Poem from Consistency by poet and journalist Khalid Mohammed Osman. Let's be the publishers of your book. Use the form at Contact Us. 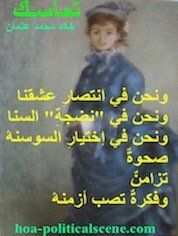 HOA Political Scene poem from Consistency by journalist and poet Khalid Mohammed Osman on Pierre Auguste Renoir's Parisian Woman. hoa-politicalscene.com - Sudanese Writer Khalid Mohammed Osman's Book, "Love in the Internet Time". 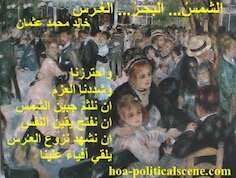 HOA Political Scene poem from The Sun, the Sea, the Wedding by poet and journalist Khalid Mohammed Osman on Pierre Auguste Renoir's Dancing Couple. hoa-politicalscene.com - Sudanese writer Khalid Mohammed Osman's book, "Political Tragedy of the Horn of Africa". https://www.hoa-politicalscene.com Copyright© Khalid Osman - Making the News Absorbed through Political Analyses!